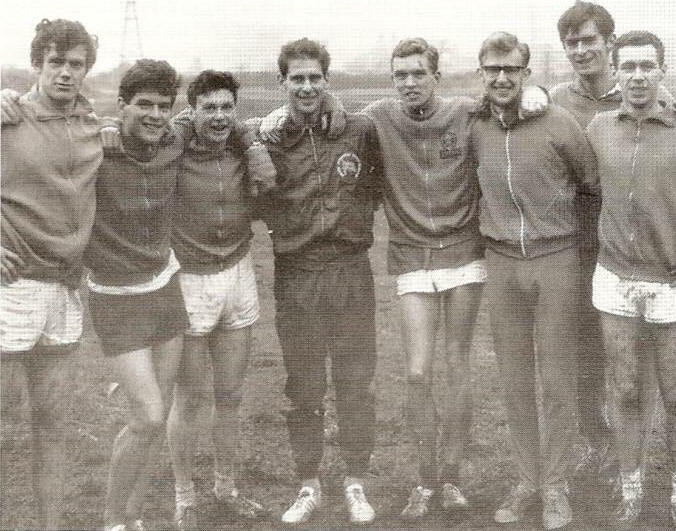 Before studying at Edinburgh, I had met two classy runners from St Andrews while with Dundee HH….Alistair Barrie and Allan Beattie but it was at Edinburgh, sharing digs with Chris Elson where my ideas were developed. Chris was a club-mate of Alan Simpson, a noted sub-4 miler from Rotherham AC . So, training started in earnest. The H&H stalwarts of the 60’s were the medics like Doug Dingwall, Mike Hartley, Alistair Mowat and Tony Yates with our most obvious rival being Glasgow with the likes of Calum Laing, Jim Bogan and Allan Faulds. Club teams like Shettleston and Bellahouston were well over the horizon and I remember in early races finding the leaders already a field ahead after about a mile….the likes of John Lineker (Pitreavie) and Steve Taylor (Aberdeen). Individual results have nothing like the memories of the Team successes where a group of us trained better and better and after a year or so, started to get results. Highlights must be winning the Edinburgh – Glasgow road relay in record time, the Imperial Colleges Hyde Park Relay, National XC Championships at Cross Country for both Senior and Junior and having 15 in the first 16 home in the Scottish Universities Cross Country first and second team races at Aberdeen. Many of us stayed in the south side of Edinburgh and met in the evenings for a fartlek road session and the whole Club met at Kings Buildings on Wednesday afternoons for a 10-12 miles fartlek session. Over a coffee, the Committee then discussed the forthcoming teams and wrote up the previous weekend’s races. We never raced each other in these sessions, but rather stretched each other. On Sunday, up to a dozen of us met up outside the Geology Dept, leaving our tracksuit on the steps and then going on the long run through the Pentlands……….21 miles (no kit was ever stolen…………probably too smelly). In the summer for 3 years, I joined Ilford AC staying with the parents of Dennis Plater (a GB marathon International) and Frank Gamwell and Alistair Blamire came to stay too. We benefited from plenty quality track races and much warmer weather than in Scotland. In the mid 60’s, Alistair Matson got the lease for a large house in Morningside for 3 years and six of the Club stayed there. On the kitchen wall a chart listed the personal mileage for the week and the aim in the winter months was for 600 miles…………on an occasion, one member was sent out on a Saturday evening to get a further 3 miles completed. It wasn’t all serious and several notable parties were held there……….largely well-behaved………….as was our celebrations at the Hyde Park disco after our memorable win where after a few beers, we ended on the stage before finally making our way to stay with Frank Gamwell’s uncle, a senior policeman, in Essex. Another leading Team member, Ian Young, used to go back home to Kirkintilloch after the Saturday race to run a disco enterprise he managed. In my early years , Chris Elson organised a week training at a cottage near Skateraw where we tried to replicate the training regime of the World icons of the era, Percy Cerutty (Herb Elliott) and Arthur Lydiard and his New Zealanders, Peter Snell, Barry Magee, Murray Halberg. I am not too sure how beneficial they were but it was certainly Spartan and a good for camaraderie. Distractions in the 60’s combined with a much simpler lifestyle, allowed hard training to be combined with significant academic effort. Faculties represented went from medicine, law, architecture, science, forestry, agriculture, business, engineering, dentistry to languages. All achieved a degree with several becoming Professors in their speciality and others building successful businesses. Fifty years on, many of us from that era are still in regular contact, some still managing the occasional run together. We rarely recall the races against each other but do remember the fun we had. I know this to be the case with many of our friends south of the border in Clubs like Coventry Godiva, Birchfield and Ilford to name a few. “Shettleston Marathon. Did you remember that 15th May was the 50th anniversary of our first marathon?! You had a great battle with Alastair Wood while I was delighted just to finish. Pre season training camp. You mention Skateraw. I wasn’t there but I do recall a very enjoyable week near Cockburnspath, staying in old coastguard cottages virtually on the beach. This was from 6th to 11th Oct. 1964. There were daily early morning runs, beach relays, sand-dunes and woodland running. Edinburgh to Glasgow Relay record. If you haven’t already got it, the attached cutting from the Glasgow Herald with Dunky Wright’s report in his own inimitable style gives a dramatic account of the race. Pentlands 21 mile run. During our time at the ‘Zoo’, I think all our Sunday 21 milers were from there. With GPS and other latest technology, I think we would find the distance to be short of 21 miles! My times were regularly under 2 hours 10 mins. I find it hard to believe in view of quite a bit of the route being off road that we could maintain near 6 min mile pace!